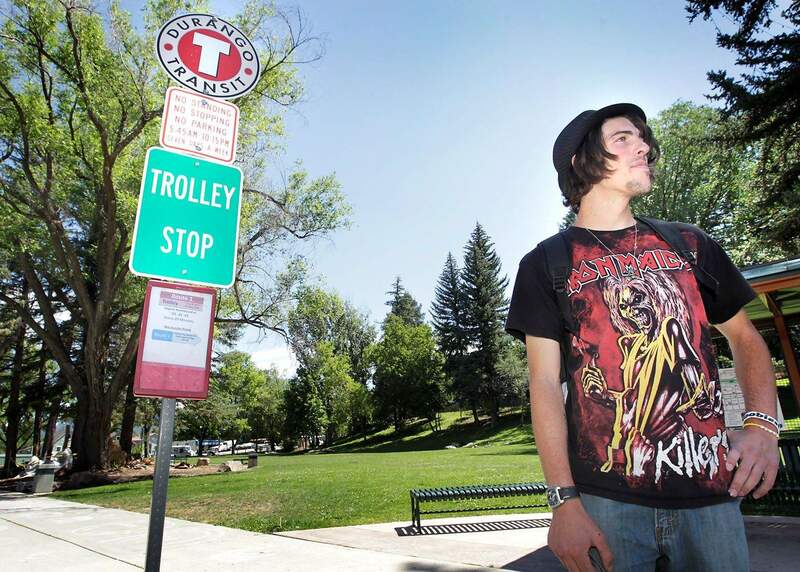 No sense driving if you can use the trolley, says Daniel Franklin of Durango as he waits for the trolley Wednesday on Main Avenue. 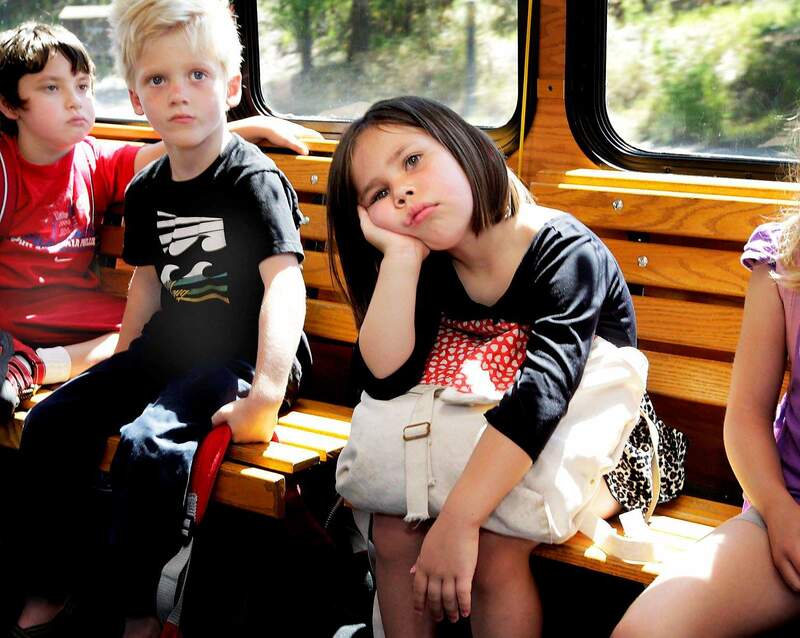 Riding the trolley might not be the most exciting thing for Grace Denny, 5, right, who was riding with other children Gavin Pavisils, 5, far left, and Owen Huff, 5, all with Game Time, a summer program of the Durango Parks and Recreation Department. Nina North and Ole Hanson leave the trolley Wednesday. Ridership jumped 14 percent for the first half of 2011 compared with 2010. Public transportation in Durango isnt your usual bus service. For starters, the most popular of its buses actually are trolley cars on wheels. And residents and visitors alike are exceptionally fond of the service. Its very convenient, resident Florence King said of the free trolley service available along Main Avenue. King, who moved to Durango from Gallup, N.M., a few years ago, has found that public transit here is free from the negative image and complicated schedules and fees that plague other cities transit systems. Whether its these reasons, the economy or both, one thing is clear: Usage of Durangos public transit service is up dramatically. Since the City Council voted in 2009 to make the Main Avenue trolley free, ridership numbers have seen double-digit increases. For the first half of 2011, trolley ridership jumped 14 percent compared with the same period in 2010. Travelers embarked on 142,000 free trolley trips during that time; in June alone, the trolleys provided 33,700 rides. In just 15 minutes time on a recent afternoon, those boarding the trolley included: several visiting tourists, an elderly man, a single mother with car troubles, a young woman who cannot afford a vehicle and two teenagers not yet of driving age. That diversity is proof the system is working well, said City Manager Ron LeBlanc. It shows the community values the free trolley. he said. Tourists, especially from foreign countries, also love the service, Blake said. Blake speculates rising gas costs, tourism upticks and local residents passion for sustainability are playing a role in the ongoing ridership increases. Public transit is a choice, and people here are making that choice, she said. LeBlanc said that devotion is what led to the service becoming free two years ago. Residents said they wanted to relinquish their dependency on vehicles, and it pushed LeBlanc to recommend that the council subsidize the trolley service and simplify fee structures for the rest of the public transportation system. Most people know there are benefits to public transportation, he said. Fewer cars on the road means more available parking, less air pollution, fewer accidents and less overall fuel consumption. Still, making the leap to offering it free takes a communitys commitment. The proposals success is a testament to the mindset of residents here, LeBlanc said. Here, there is a genuine excitement about sustainability and the big-picture benefits of the service, he said. But the trolley service isnt immune to the financial factors that are pushing people to use it more. Just as for residents, the citys fuel costs are rising, and its taking a toll on the public transportation budget. It costs about $3.66 per mile for the trolley to run, and each riders trip comes at a cost of $1.20, up 24 cents from last year, Blake said. Despite the cost increases, the department wont request a budget increase this year, Blake said. Meeting the growing demands would require investing in additional vehicles and employees, she said, and big capital investments are a hard sell in an ailing economy. The service collaborates with other public organizations whenever it can, LeBlanc said. The Business Improvement District, a special taxing district for downtown businesses, subsidizes some of the costs associated with providing evening trolley service during the summer. Its one of the trolleys busier times, especially during the weekends, when riders like to visit restaurants and bars downtown without parking hassles and concerns about drinking and driving, Blake and LeBlanc said. The city also is working to help Durango School District 9-R see more savings in transportation costs through increased trolley use, LeBlanc said. Many students already use the trolley to get to after-school programs during the week, said Laura Hager, program director for the Boys and Girls Club of La Plata County. And several local teens without cars said they rely heavily on the service to get around town. Though tight budgets mean it cant be immediate, more trolley buses and employees to meet the growing demands are inevitable, LeBlanc said. More technology also is likely. Among the future possibilities are stationary digital signs at the trolley stops indicating when the next trolley will arrive, he said. 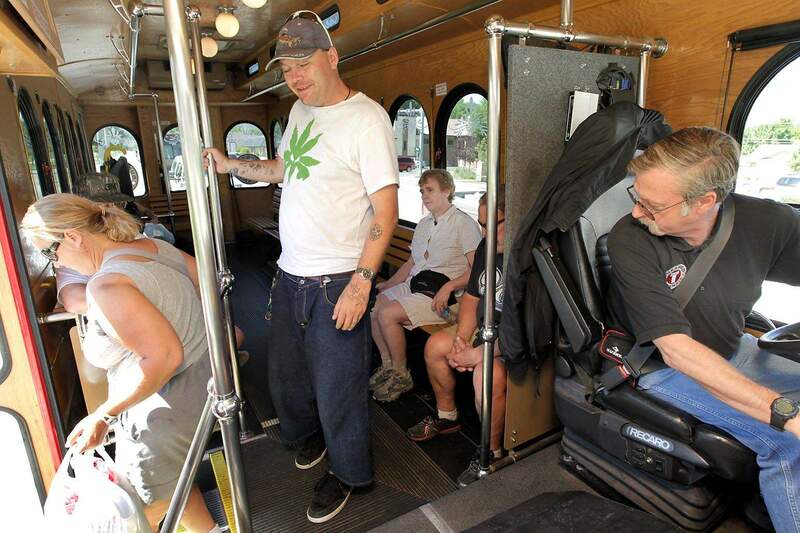 Its all welcome news for people such as Taylor and 13-year-olds Kyle Buran and Anthony Manzanares, who rely on the trolley to get around. The teens rode the trolley one afternoon this week from Burans house to lunch at McDonalds and then on to Manzanares house. If not for the free service, the pair said the trek would take all day and would have them walking for miles. I love that we can go pretty much anywhere we want to without a car, Buran said.